Previously, we have seen iPads on sale for $20 off at Future Shop and Best Buy. The 13.3″ MacBook Air and 21.5″ iMac is better than Apple’s Education pricing for the same models by $50, whereas the 13.3″ MacBook Pro matches it. 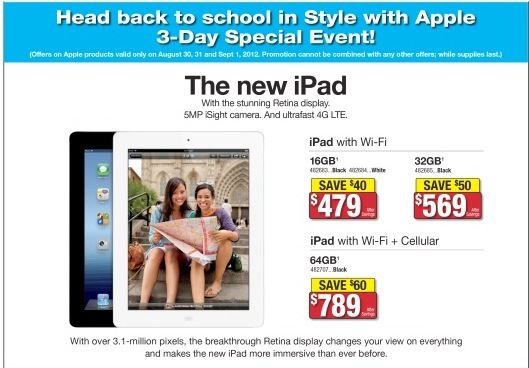 Do note Apple’s Back to School Promo is still ongoing until September 21st. Purchase an iPad and receive a $50 iTunes card; purchase any Mac and receive a $100 iTunes card. 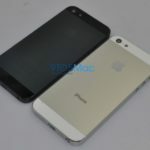 Also, according to some Apple Stores I’ve talked to on the phone, they do match competitor pricing. So if you don’t have access to education pricing, march into a store and show them the Staples ad. Let me know if you’re going to do some shopping this weekend!